Apple products have always been known for their clean, white exterior. From computers to mp3 players, iMac’s, MacBook’s, MacBook Pro’s, and the original iPod’s were all released in the classic Apple white color. However, the iPhone has always only been available in one color. Since it was first released under AT&T, the iPhone has only been made in black. There has always been a demand for more variety in the colors and shades that the iPhone comes in. After making its debut under the Verizon brand, even more phone users have purchased iPhones and also began to demand more choices in what their phone looks like. Thursday, Apple finally gave the people what they have been wanting for years. Thursday, stores throughout the country began to sell the brand new white version of the iPhone 4 for both AT&T and Verizon Wireless. While many were happy to finally see the iPhone in the classic Apple white color, some were not pleased with one other difference in the new phone. The new white iPhone is just a tad bit bigger than the classic black color. 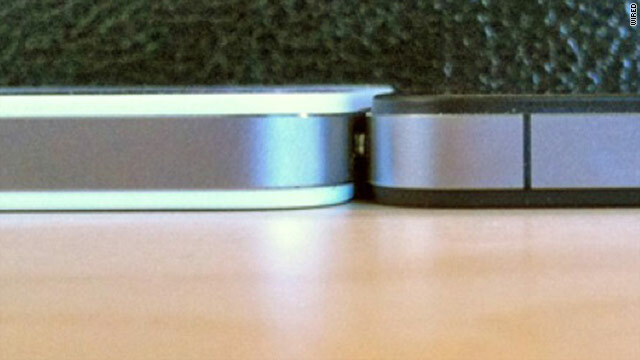 According to a measurement taken by wired.com, the new white version is thicker than the original black version by a grand 0.2 millimeters. It may not seem that a small difference like 0.2 millimeters would matter to anyone, but to those who upgraded from the black version to the white version this week, there are some issues being encountered. The main problem is that some owners have cases for their phones that were made to perfectly fit the black iPhone, but are simply not thick enough to hold the new white model. iPhone users who switched to Verizon from AT&T went through something similar when they realized that the mute button on the Verizon version was moved over just a little bit and was not perfectly located when the iPhone was placed in a case. Speculation among experts suggests that the reason the new phone is slightly thicker is due to the necessary extra coating to keep the camera working properly as more sunlight can get through a white coat than a black coat. For the time being, there are some who are making a big rumble over the 0.2 millimeters and then there are others who most likely did not even notice that there was any difference in terms of thickness. Towards the end of 2011 a new iPhone is going to be released. Whether or not the size issue is addressed has yet to be determined. The article states there has only ever been a black iPhone… What about the white iPhone 3G? And the white 3GS? In this article there is an inaccuracy, the iphone 3G and 3GS has been available both in white and black, only the iphone 4 was available just in black until now.